Blue Phoenix Financials has showed me clearly how money can be made from quality, in-depth information. Instead of pushing products like everyone else, Blue Phoenix Financials explains its strategies in a simple, focused manner and has enabled me to profit from the global financial markets. 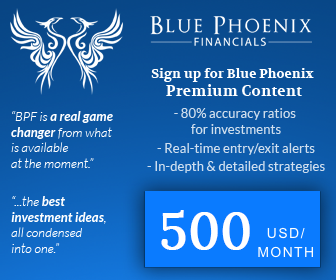 Blue Phoenix Financials is great for busy people who don’t have time to research information on global developments affecting financial markets and specific company information. They provide all that I need to make a decision on which equity I can buy. So far their recommendations have resulted in good returns. I would not have gone this far with my investments without the service. I find Platinum Circle advice timely and simple with clear targets on entry and exit. It’s like having your personal financial analyst next to you when you invest. Thanks Ashwin.